The Westslope Cutthroat trout is currently ranked "S2" in Montana because it is at risk due to very limited and/or potentially declining population numbers, range and/or habitat, making it vulnerable to extirpation in the state. The Westslope Cutthroat Trout is one of two subspecies of native cutthroat found in the state. Together, they have been designated Montana's state fish. Cutthroat trout are so named for the red slashes near the lower jaws. 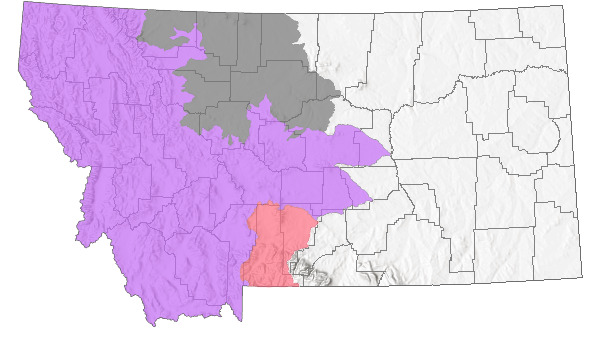 The Westslope Cutthroat Trout's historical range was all of Montana west of the Continental Divide as well as the upper Missouri River drainage. This fish has been seriously reduced in its range by two primary factors: hybridization with Rainbow and/or Yellowstone Cutthroat Trout, and habitat loss and degradation. Since the Westslope is recognized as a very important part of our native fish fauna it has been designated a Montana Fish of Special Concern in Montana. Pure Westslope Cutthroat Trout have been identified by genetic analysis and form the broodstock maintained by the Montana Department of Fish, Wildlife, and Parks at its Anaconda hatchery. The average size of these fish is 6 to 16 inches, depending on habitat, but they rarely exceed 18 inches in length. Tiny teeth are usually present on the floor of the mouth behind the tongue. The lower sides are red during spawning season (Montana Fish, Wildlife, and Parks). In Montana both pure and moderately hybridized populations of Westslope Cutthroat Trout have a high incidence of basibranchial teeth, whereas pure Rainbow Trout lack these teeth. The presence of basibranchial teeth in some individuals of a Rainbow Trout population indicates hybridization with Westslope Cutthroat Trout (Leary et al. 1996). It can be difficult to visually distinguish Westslope from other cutthroat trout subspecies, but the Westslope Cutthroat Trout tends to have more small spots by the tail and none by the pectoral fin and the fish is more of a silvery or greenish color. The only way to be certain about identification of this subspecies is by genetic testing (Montana AFS Species Status Account). The westslope cutthroat trout is found in the Kootenai watershed, the Clark Fork watershed, the headwaters of the Missouri river and the headwaters of the Saskatchewan River. This subspecies is also found in the Salmon River and Coeur d'Alene Basins of Idaho and Canada and has a few scattered populations in Wyoming, Washington and Oregon. Westslope cutthroat trout have three possible life forms, adfluvial (migrates to lakes), fluvial (migrates to rivers) or resident (stays in streams). All three life forms spawn in tributary streams in the springtime when water temperature is about 10 degrees C and flows are high with spring run-off. Spawning and rearing streams tend to be cold and nutrient poor. Westslope Cutthroat Trout seek out gravel substrate in riffles and pool crests for spawning habitat. Cutthroat trout have long been regarded as sensitive to fine sediment (generally defined as 6.3 millimeters or less). Although studies have documented negative survival as fine sediment increases (Weaver and Fraley 1991), it is difficult to predict their response in the wild (McIntyre and Rieman 1995). This is due to the complexity of stream environments and the ability of fish to adapt somewhat to changes in micro-habitat (Everest et al. 1987, Montana AFS Species Status Account). Westslope Cutthroat Trout also require cold water, although it has proven elusive to define exact temperature requirements or tolerances. Likewise, cutthroat trout tend to thrive in streams with more pool habitat and cover than uniform, simple habitat (Shepard et al. 1984). Juvenile cutthroat trout overwinter in the interstitial spaces of large stream substrate. Adult cutthroat trout need deep, slow moving pools that do not fill with anchor ice in order to survive the winter (Brown and Mackay 1995, Montana AFS Species Status Account). Westslope cutthroat trout primarily are invertivores through most life-stages: eating insects and zooplankton and do not grow very large, usually just between 6 and 12 inches. Larger-aged fish (greater than 12 inches) may eat sculpin or other small aquatic vertebrates. Westslope Cutthroat Trout have three possible life forms, adfluvial (migrates to lakes), fluvial (migrates to rivers) or resident (stays in streams). All three life forms spawn in tributary streams in the springtime when water temperature is about 10 degrees Celsius and flows are high (Liknes and Graham 1988). While resident fish spend their entire life in tributary streams, migratory life forms can travel several hundred kilometers as they move between adult and spawning habitat (Montana AFS Species Status Account). In Montana, the maximum age of 475 fish from 29 headwater streams was 8 years-old based on otoliths (Downs 1995). In headwaters streams in Montana, age at sexual maturity ranged from 2 to 4 years-old for males and from 3 (26%) to 5 (93%) years-old in females (Downs 1995). Size at sexual maturity in these streams ranged from 110 to 160 millimeters in males and 150 to 180 in females (Downs 1995). Female fecundity ranged from 198 to 630 eggs and was generally correlated with length (Downs 1995). Management of this species involves protecting the population strongholds and making tough decisions on restoration priorities for the depressed populations. The State of Montana has altered fishing regulations to reduce fishing mortality. Montana has also developed a Conservation Agreement signed by nine government agencies and conservation groups (Montana Department of Fish, Wildlife and Parks 1999). This agreement prioritizes protecting genetically pure populations first, then slightly introgressed populations. Recovering depressed populations will involve habitat restoration and removing non-native species. Research suggests that it is not a good idea to bolster populations with stocked fish from other watersheds due to considerable genetic variation between watersheds (Leary et al. 1998). It will be especially challenging to recover migratory life forms. Governmental agencies will need to work together to share expertise, pool financial resources and monitor progress toward restoration of this species (Montana AFS Species Status Account). There are four primary reasons for the decline of this species. 1) Habitat loss is considered to be a widespread problem. Cutthroat trout have declined due to sedimentation and warming water temperatures in streams due to poor grazing practices, logging, mining, agriculture, residential development. Loss of hundreds of stream miles of spawning habitat due to dewatering of streams for irrigation and barriers created by dams and road culverts. 2) Non-native species have also taken a huge toll on westslope cutthroat trout. Brook trout, rainbow and brown trout outcompete juvenile cutthroat trout for food and dominate a stream. 3) A third reason for decline is the role of hybridization with other species. Westslope cutthroat trout readily hybridize with rainbow trout and other non-native cutthroat trout subspecies. 4)A fourth cause of decline has been overfishing and harvesting. 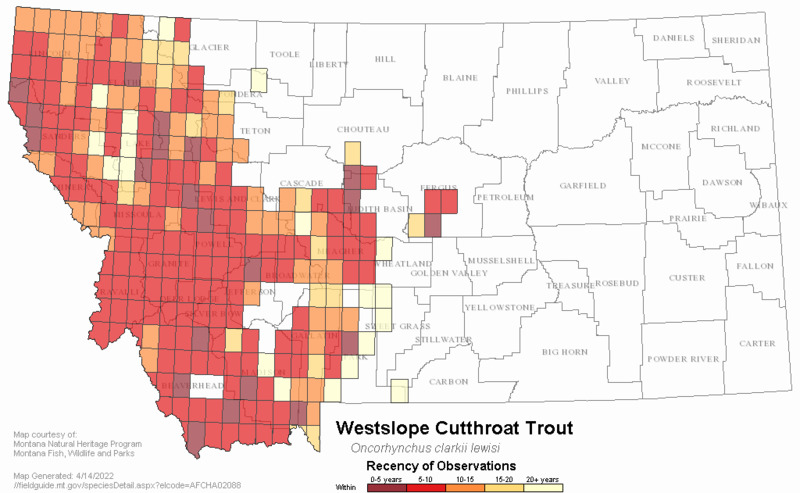 Westslope cutthroat trout are highly susceptible to angling. Behnke, R. J. 1992. Native trout of western North America. American Fisheries Society Monograph 6. Brown, R.S. and W.C. Mackay. 1995. Fall and winter movements of and habitat use by cutthroat trout in the Ram River, Alberta. Transactions of the American Fisheries Society 124(6): 873-885. Downs, C. C. 1995. Age determination, growth, fecundity, age at sexual maturity, and longevity for isolated, headwater populations of westslope cutthroat trout. M.S. Thesis, Montana State University, Bozeman. 81 pp. Everest, F.H., R.L. Beschta, J.C. Scrivener, K.V. Koski, J.R. Sedell and C.J. Cederholm. 1987. Fine sediment and salmonid production: a paradox. Pp 98-112 In: Streamside Management: Forestry and Fishery Interactions. University of Washington, Seattle, Washington. E.O. Salo and T.W. Cundy, tech Ed. Leary, R.F., W.R. Gould, and G.K. Sage. 1996. Success of basibranchial teeth in indicating pure populations of rainbow trout and failure to indicate pure populations of westslope cutthroat trout. North American Journal of Fisheries Management 16:210-213. Liknes, G. A. and P. J. Graham. 1988. Westslope cutthroat trout in Montana: life history, status, and management. American Fisheries Society Symposium 4:53-60. McIntyre, J. D., and B. E. Rieman. 1995. Westslope cutthroat trout. Pp 1-15 In: M. K. Young, technical editor. Conservation assessment for inland cutthroat trout. USDA Forest Service General Technical Report RM-GTR-256. iv + 61 pp. Montana Chapter of the American Fisheries Society species status accounts. Montana Department of Fish, Wildlife & Parks. 1999. Memorandum of understanding and conservation agreement for westslope cutthroat trout (Oncorhynchus clarki lewisi) in Montana. 28 pp. Shepard, B.B., K.L. Pratt, and P.J. Graham. 1984. Life histories of westslope cutthroat and bull trout in the upper Flathead River Basin, MT. Environmental Protection Agency. 85 pp. Gustafson, D.R. 2001. 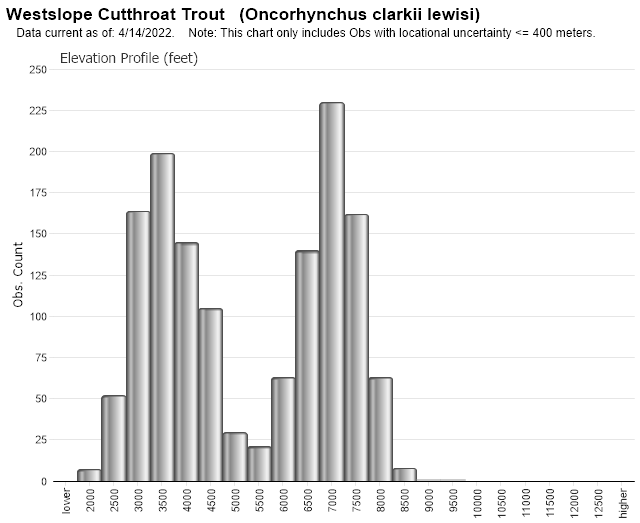 Westslope cutthroat hypothesis. Presentation to the American Fisheries Society Meeting, Bozeman, MT. Liknes, G.A. 1984. 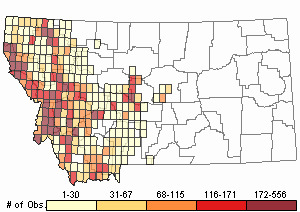 The present status and distribution of the westslope cutthroat trout (Salmo clarki lewisi) east and west of the Continental Divide in Montana. Montana Deptartment of Fish, Wildlife, and Parks. 163 pp. Moser, D., Tews, a., Enk, M. 2006. Northcentral Montana cooperative westslope cutthroat restoration project, 2005 Annual Report. Western EcoTech, Helena, MT., 1999, Wetland delineation report for the Haskins Landing Proposed Wetland Mitigation Area. MWFE? June 2, 1999. 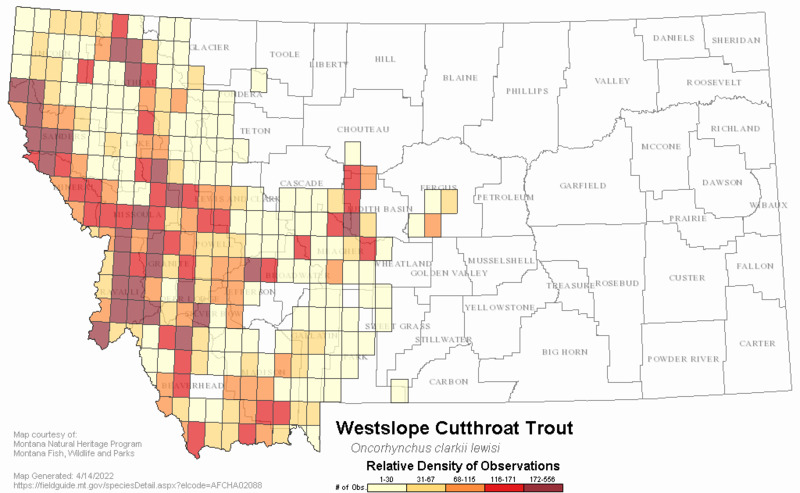 Web Search Engines for Articles on "Westslope Cutthroat Trout"